The perfect warm-up to the summer holidays - and just as delicious the rest of the year! Pick a mild chorizo and remember that it's always up to you whether you want to buy ready-made dough and tomato sauce or make your own. If you want to make your own, just click the little chefs' hat in the ingredient list! 1. Preheat your oven to 250 degrees non-convection with a baking tray on the bottom shelf. If you have a pizza stone, put it on the baking tray in the cold oven, before turning it on. Rinse and clean peppers and mushrooms. Cut the pepper into strips and mushrooms into slices. Remove the skin from the chorizo (if you want to, this is optional). and slice the sausage. Remember to wash your hands and utensils when you're done - especially if you've bought fresh chorizo. 2. Sprinkle some flour onto a clean tabletop and roll out the pizza dough to about 30 cm in diameter. Be careful not to make them too thick! This bit is important: If you don't have a pizza peel, move the pizza dough to a piece of baking parchment with your hands before you apply the sauce. 3. Spread the tomato sauce on the pizzas. Keep the pizza sauce off the outermost centimeter of the pizza. 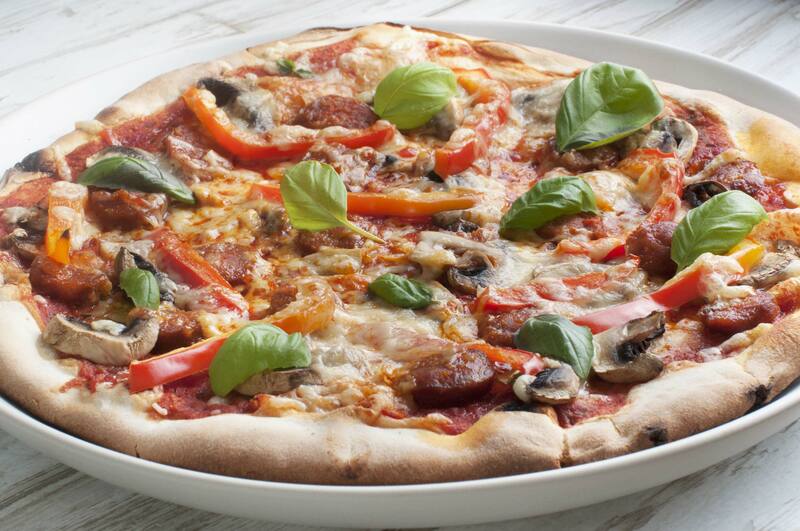 Spread the chorizo, peppers and mushroom and finally the mozzarella in small pieces across the top. 4. Move the pizzas to the oven with a pizza peel, or slide a cutting board under the baking parchment holding your pizzas and move to the baking tray. Bake the pizzas for 10-15 minutes, until the cheese is golden and the crust crispy. Feel free to garnish with fresh basil or other herbs if you have any handy. 5. Wash the cucumber, peel the carrots and cut both into sticks for snack veggies, to serve as a side for the pizzas. Enjoy! For two adults and two kids this recipe will make two pizzas. If you're working with different numbers, a good key is 200-225 grams of pizza dough per pizza. If you're cooking for very young children, you can boil the carrots, or swap them for soft veggies like cherry tomatoes or sweetcorn. If you have leftover chorizo, save it and use it in an easy and delicious pasta.